Last night we finished the front windows on the drivers side as seen in the earlier post. Here is a pic of it completed from the outside. 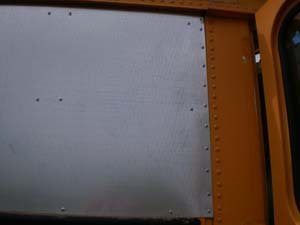 Here is the rivet work. Rivets are just cool to work with. Our first task today was to complete the metal on the drivers side. Following all the steps listed before in this blog we were able to get it done rather quickly. I am finally using a good bit ($20) for drilling out the old rivets and it helped save time and energy. I think it would be impossible to break this bit. 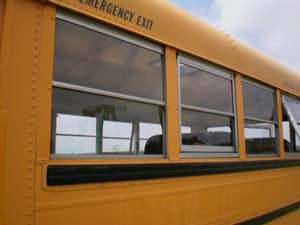 Here is a view from the outside before the metal went up. Here it is after from the outside. 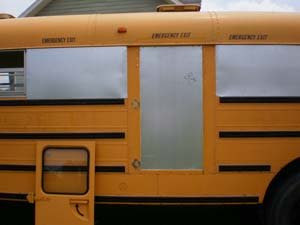 Now all the windows that needed to be covered are covered. 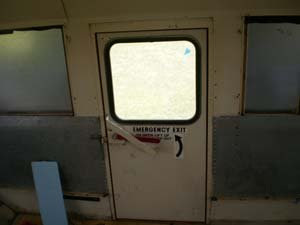 Next was the side Emergency Exit. Here it is before the metal has been installed from the outside. 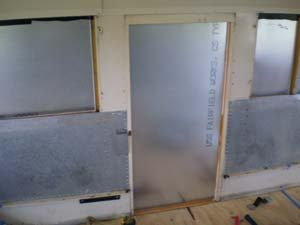 With the removal of 6 screws on the outside the door came off quite easy. That door was built like it was designed to go on a submarine...it was heavy. 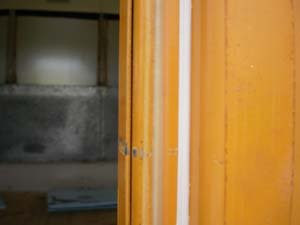 Now that the door is removed I noticed some weld lines in the corners of the frame. I took a chisel and smoothed out the weld lines. Now I can put in the metal. I wanted a good seal for the metal when I installed it against the frame. I did a bead of Liquid nails on the inside for holding power and a bead of caulk on the outside edge of the frame for a seal. The picture below it is kind of hard to make out. The faint brown bead is the liquid nails. The white bead is the caulk. Next I put my metal in place and drilled a few holes and installed a few rivets just so it was held where I wanted it. Then I drilled all my holes and installed my rivets. 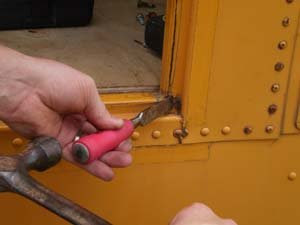 I am now all out of rivets and need more to finish this door completely. 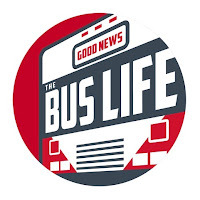 For now it is good. 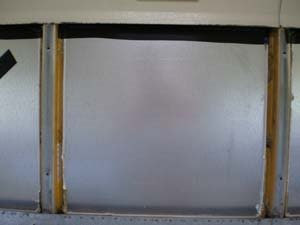 After this we went around and flashed the top edge of all the metal on the inside where the windows used to be. This will insure a good seal and a vapor barrier. 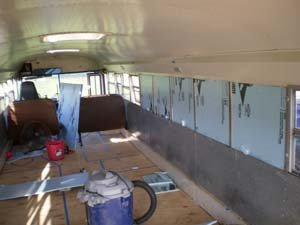 We needed more foam insulation so we cleaned out the bus and took a drive to the local lumber yard and picked up 4 more sheets for insulating where all the windows used to be. Our total bill was $40.00. Before installing the foam I applied liquid nails to the metal that the foam will be resting against. Again I hope that this will allow the metal to adhere to the foam and act as a sound deadened. I cut all the pieces of foam about 1/16 larger then the actual opening size. This gave the foam a very tight fit. 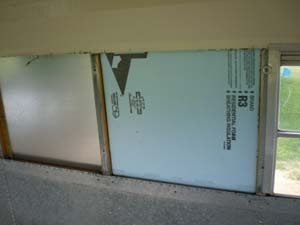 I installed 2 boards of foam per window opening. This currently gives it and R-6 value. 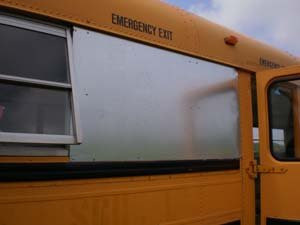 By the time the bus is done it should have an R-12 value where the windows were. 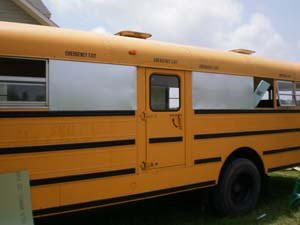 Here is the passengers side completed. Here is the drivers side completed. While I was doing this my wife was laying out a detailed floor plan. She used blue masking tape and placed it on the floor showing where everything will go. 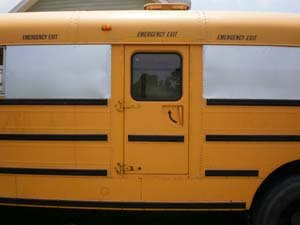 I still have to finish prepping the bus for paint. That is the next big step. More to come soon. What kind of rivets did you use for this project? 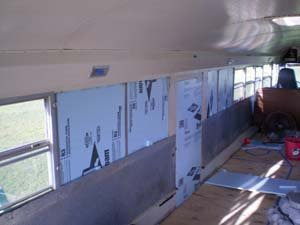 I'm riveting skin over windows on our skoolie but still can't figure out what the most appropriate type and size of rivet to use. I'd like to do it right the first time.